Welcome to Bingo Blitz, the #1 free bingo game online! Take a trip around the Bingo World with your Bingo host - Blitzy! Join his bingo party and play bingo games for free. Get your daubs ready for all the BINGOS you can handle! The #1 Bingo game in the store, the #1 Bingo and Slots game in the world! Get Cookin' with Blitzy and GUY FIERI! Inspired by Blitzy’s travels in Italy, Blitzy and guest chef Guy Fieri have teamed up to create a menu like no other and are dishing it out at Blitzy’s Trattoria! Join them on this exciting bingo game adventure and learn how to create delicious Italian-American dishes from the BEST! Collect the finest Ingredients from around the Bingo Map in your favorite Free Bingo Game! 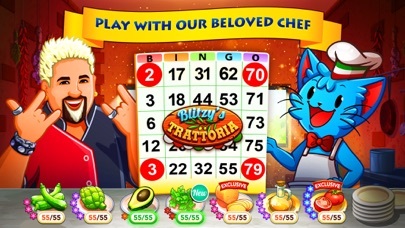 Join Guy Fieri in the Blitzy's Trattoria kitchen & cook up piping HOT bingo Prizes & Rewards! Step into a Bingo heaven! 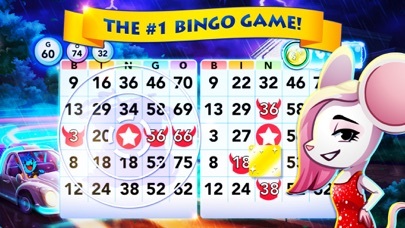 Play free bingo games for fun and enjoy exciting bingo game features like: ► GOLDEN BONUS WHEEL with BIG Bingo bonuses ►Themed bingo rooms in famous BINGO CITIES FREE BINGO GAME BONUSES ► Challenging quests to go on across the bingo board ► Games of bingo with AWESOME FREE PRIZES ► Seasonal and Featured Bonus Bingo Rooms ► Mega prizes, BONUS WHEELS, rewards, & gifts! JINGLE BUDDIES ARE BRINGING IN THE HOLIDAYS EARLY! By golly! The Holiday celebrations are starting early this year with Bingo Blitz’s JINGLE BUDDIES! Blitzy just couldn’t wait to celebrate the holidays and is bringing you the jolliest bingo game collectibles feature you have ever seen! Collect all Buddies, fill up your albums, and win FUN PRIZES and HUGE BONUSES! Collect Jingle Buddies as you play free bingo games and win prizes for filling up your album with jolly Jingle Buddies. Collect all your Bingo lovin’ Buddies to win the bingo MEGA PRIZE! It’s never too early to celebrate the holidays with the best free bingo game! Walkin’ in a BINGO WONDERLAND! Play special lucky bingo cards in every game of bingo in real time and spin the bonus wheel to earn free coins, daubs, and more! 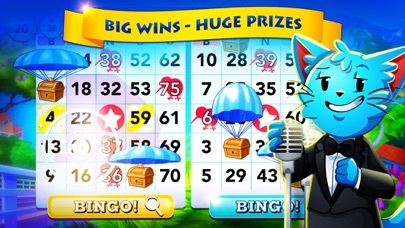 Bingo Blitz is an online bingo app adventure that combines absolute skills with luck. 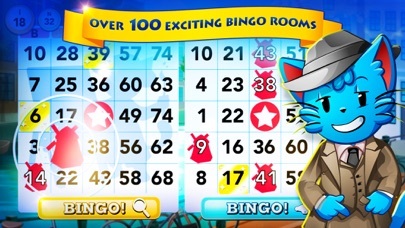 Bingo Blitz is your only source for an absolute bingo party adventure! 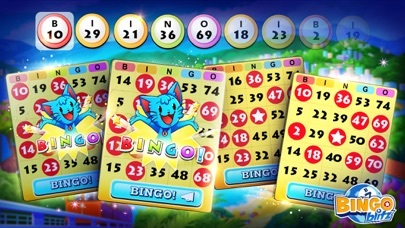 Play Free Bingo Games with Fantastic Features There are so many stunning bingo rooms for you to call out your BINGOS! Pick your favorite lucky bingo city on the bingo game map and get your dauber ready. 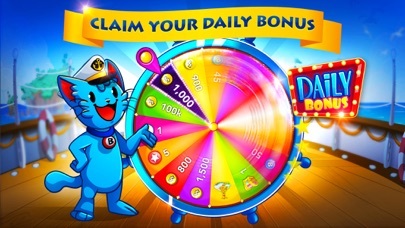 Start playing bingo games for free in epic bingo halls, get rewards and tickets to even more challenging online bingo rooms, while enjoying these incredible features along the way: ► FREE COINS and CREDITS – get Daily bingo bonuses & spins on the bingo slot machine and bonus wheel. You can also play mini games for prizes while waiting for your rounds to start. 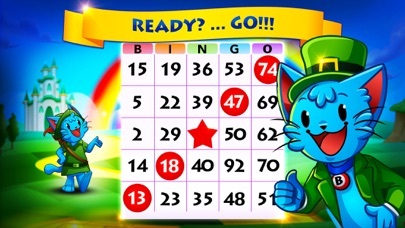 ► Complete free to play bingo QUESTS for more free credits. ► Play bingo games for free in SEASONAL and FEATURED rooms - open to all and offering new ways to win bigger prizes, more collection items, and free rewards. ► Power ups, boosts and bingo points – the extras you’ll need to Win and level up faster ► Surprise GIFTS – it’s a bingo holiday! Play multiple free bingo game cards with daubers to open treasure chests and mystery chests for lucky rewards Bingo Blitz Albums and Collections Bingo Blitz introduces so much more than a simple bingo play. Your free online bingo adventure includes completing collections to win mega prizes. Anchorage, Cape Town, Catalina, New York, Madrid, Istanbul and many more cities hold the key to your Bingo Collections. We would love to hear from you! You can reach us at http://Bingoblitz.support.buffalo-studios.com. BINGO Blitz contains optional in-app purchases. This game is intended for an adult audience (21+) for amusement purposes only and does not offer ‘real money’ gambling, or an opportunity to win real money or prizes based on game play. Playing or success in this game does not imply future success at ‘real money’ gambling. This game/app only wants you to spend money!!! EVERYTHING in the game is pushed in that direction. I’m talking at ridiculous levels too!! Let me give an example. The site uses what they call powerups in the game. I have almost 75k in these powerups. The 2 powerups that everyone wants to get are Instant and Super Charger. I currently have 2 each of these out of 75k! That’s because they want you to buy these powerups! The site also has side quests. Here is the current quest. Get 28 bingos with Legendary Boost! Let me break that one down for you. Legendary Boost is using 540 credits per game and they want you to do it 28 times!! Over 15k in credits! You get approximately 120 a day. 2 games at a regular level. Oh by the way, after you spend money for the 28 games at legendary boost, you don’t win credits. You win food items on the OTHER side game they are currently running where you get to spend you guessed it, MORE money. I understand the developers are out to make money. And they should! But this site takes it to the extreme. They have it down to a science. There is nothing that doesn’t cost money! They have a good product but unless you have cash burning a hole in your pocket you will only be frustrated when your 2 games a day take you months to finish a room. Just walk away! Ok I’ve been playing this for a bit and I cannot get a single Bingo EVER! I’m getting annoyed because I’ve played about 50 rounds and only got a Bingo 2 times! I am not happy that no matter what I can’t get a Bingo so I’m probably going to delete this because I’m VERY annoyed by this. This game used to be a delight to play, I know because I’ve played for 5 years on numerous devices. The lower levels were fun as well as challenging. The fun is gone now, replaced by frustration and difficulty. I’ve spent months in a single room trying to win the Ungiftables. The only way you can really ever win them is to boost your game which more than doubles the amount of chips it takes to play a game. And that’s just one boost! If you choose to boost it 3 times to almost 400 chips for a single game. Yes, you can trade for items you can’t get but you can’t trade for the Ungiftables. Some needed shadow items only show up once in a great while. BB has now added a restaurant scenario which means you have to collect ingredients to make dishes for a chip reward. These show up in chests....instead of the items that you need to complete a room. Unless you intend to spend heaps of real money, I would advise you to avoid this game or just play till it gets ridiculously hard then delete it and start over. Too bad because it used to be a pleasure to play until greed got in the way. First time playing,,, not sure of all the rules yet but having fun!! I’ve been playing Bingo Blitz for so many years. Back in the day it was so exciting, now not at all. Don’t play and expect to get excited. It’s not at all what it use to be. Years ago you completed a mission and you got higher Daily Tokens. I use to have a great daily payout until they changed that and dropped my daily’s for all the hard work and missions I completed. That’s just greedy!! I only get 109 daily credits and all most all my rooms are completed. What a joke!People are lucky if they can play 2 rounds of 4 cards, again greedy! Even when you boost and win on a card the payouts don’t equal what you payed so what’s the point. I would hope to have won some extra! Also the chests are a joke. The slots are extremely boring. I’ve been waiting for a new room for years now. It’s time you really gave back to your customers for playing daily. I mean seriously what are you losing by giving more. 109 credits means I can play one round and 4 cards. Until they change their greed it will remain 2 stars. Yes the graphics are good but that’s all. They go to fast to keep up, tournaments are pay to win using bonuses, over all not worth wasting my time on. Uninstalled. Fun but is expensive to get far. Addictive. $100 get you about an hour of play time before you run out of credits. 76 free credits given a day only gives you a basic play. Credits need to be higher the more you play as the rooms take more credit every time. With the amount of money I have spent on this game (like I said, addictive) I should be winning money. Don’t get addicted.